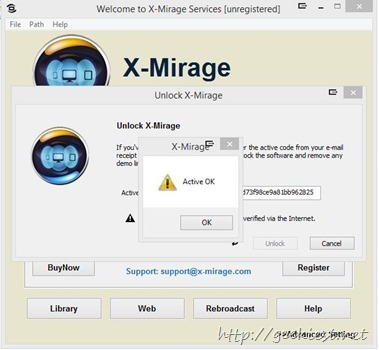 X-Mirage is an application which can mirror your iOS device screen to a Windows PC monitor. Your iOS device should support AirPlay. The iPhone 4s or above devices support the AirPlay. AirPlay allows you to stream to other device which is on the same Wi-Fi network. So with this application you can play games , watch videos etc on a bigger screen. The application cost is $16 normally, but you can get this for Free just today. To get a free full version license of the X-Mirage, you can download the zip file which also includes the instructions from the Giveaway page. Unzip and read the readme.txt file for How to get a key. To get a free license you will have to enter your email on the page (url will be on the readme file) and you will receive an email with the activation key. When I tried to install the application via setup file inside zip, it showed an error says setup is corrupt, If you face the same issue just download the application from the product website and activate it using the key you received in the email.